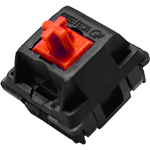 Similar in feel to Cherry MX Reds, Greetechs offer a keystroke smoothness on par or better than their Cherry counterparts. Have experience using Greetech Red switches? Add a review to share your knowledge with the keyboard community.